Black holes are some of the strangest (and most controversial) objects in the universe. But the idea that something like a black hole could exist has been around for centuries. More recently, in the last 40 years, astronomers have been finding stars in high speed orbits around what appears to be nothingness. Black holes are prime candidates for what anchors these stars to their orbits. 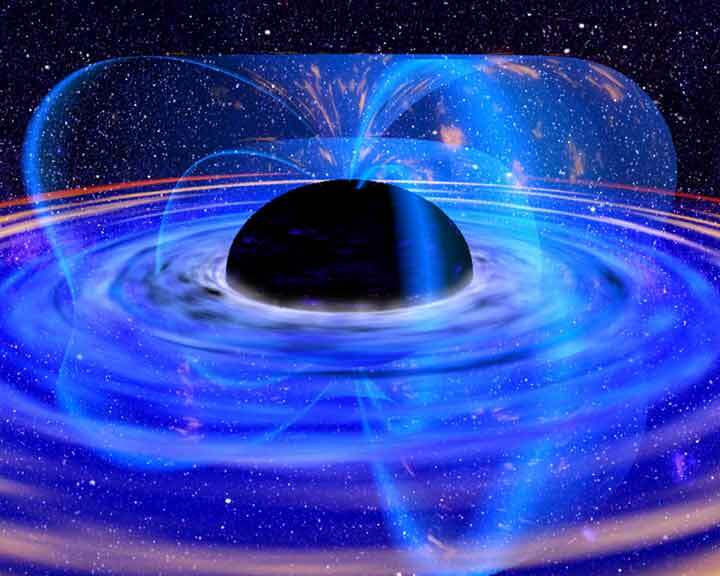 Don't let the name trick you, a black hole is not just a hole of nothingness, it’s exactly the opposite. It’s an area that has a huge amount of matter packed into a tiny space, this causes extreme gravity. Imagine the Earth being crushed down to about the size of a marble, that’s how dense an object has to be in order to become a black hole. The planet Uranus is about 14 times more massive than Earth, but the gravity on the surface is actually less than Earth’s gravity because Uranus’ mass is much more spread out. So the amount of gravity an object has is not determined only by the amount of matter in it, but mainly by how tightly compacted that matter is. If the Earth were slowly crushed down to the size of a marble, everything on it would get progressively heavier. Eventually trees and buildings would collapse under their new higher weight. No one would be left standing because our bodies would get to the point of weighing thousands of pounds and more. Even light rays shining around would start bending toward the ground. Eventually the gravity would become so strong that even a light beam shone straight up would fall back to the Earth, bounce along the ground and be absorbed into it. At this point the Earth would be considered a black hole. It would be about the size of a marble. Looking in on the Earth, you would see nothing but the blackest blackness you’ve ever seen since there would be no light escaping from it. From this stage there would be no chance of the Earth springing back to its normal size, even if our imaginary crushing action stopped. Gravity itself would be strong enough now to have a runaway effect and continue crushing it down to a size so small it would be called a singularity. Nobody knows how small it would actually be. It seems absurd to think of an object as large as our planet being crushed so small but it is theoretically possible. We tend to think of heavy objects such as a chunk of iron to be completely solid. But in reality there is a large amount of empty space between the atoms that make up the iron. Then inside each one of the atoms are vast empty areas between the nucleus and the electron cloud. There is even more empty space between the smaller sub-atomic particles. All this empty space allows matter to be crushed into much smaller areas such as the singularity of a black hole. Anything that gets close to a black hole risks being swallowed into the darkness, never to be seen again. 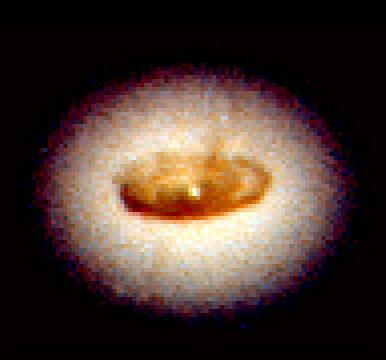 Astronomers first proposed that stars could be swallowed by black holes in 1975, but it took about two decades before convincing evidence of it was found. When a star gets too close, it is ripped to shreds by the strong gravitational force and gets pulled apart into long thin strands as it spirals inward toward the black hole. This ferocious battle between the stars kinetic energy and the black holes gravity releases tremendous amounts of radiation in the form of light, x-rays and radio waves which can be visible to us on the Earth. Black holes can form after massive stars experience a supernova explosion that disrupts the stars normal steady outward pressure. When there is not enough outward pressure inside the star, the core can implode and collapse into a black hole. A black hole can form if the leftover mass after the supernova explosion is three or more times the mass of the Sun. A black hole exerts a gravitational attractive force on everything around it that exceeds anything we've ever known. Even whole stars can be arrested by its inescapable grasp. But before they even reach the black hole they are contorted beyond recognition as a result of the intense war between the outward kinetic energy from the star’s blinding speed, and the overwhelming inward gravitational pull of the black hole. The black hole wins, even light itself is too heavy to escape from a black hole’s grip. The doomed star succumbs to being pulled apart, spaghettified, and ripped to shreds, forming an inward spiraling accretion disk around the black hole. Even a solid object like the Earth would be violently torn to pieces and sucked into the disk. As the matter spirals in toward the ominous blackness it releases huge amounts of energy and blinding light in a final desperate gasp before becoming another morsel of cosmic toast in the feast that’s feeding the voracious appetite of the insatiable black hole. At times the matter spiraling in through the accretion disk becomes so energized that it produces a jet of particles that are catapulted out before being captured by the black hole. 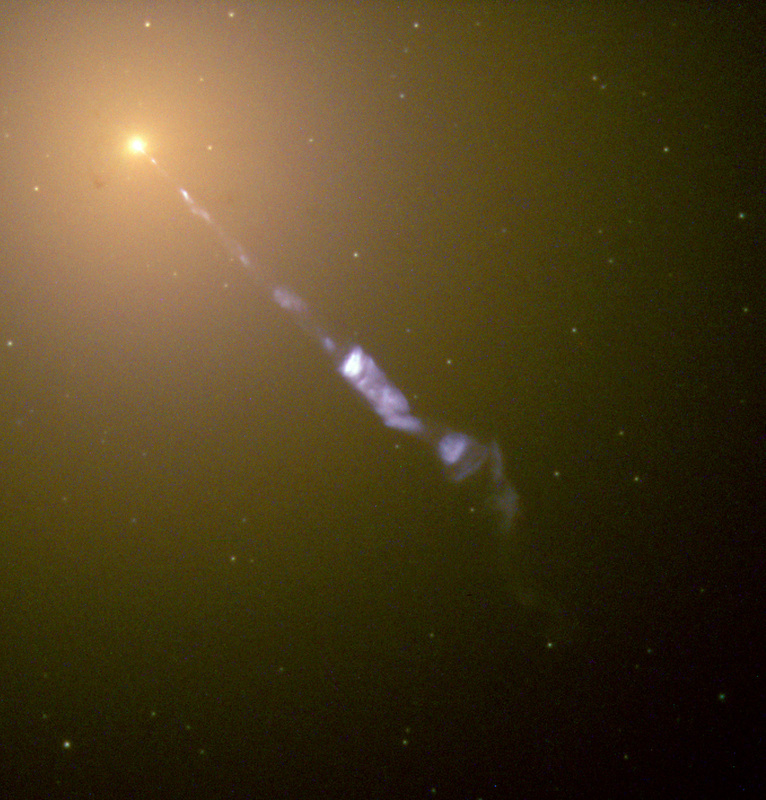 Streaming out from the center of the galaxy M87 like a cosmic searchlight is one of nature's most amazing phenomena, a black-hole-powered jet of electrons and other sub-atomic particles traveling at nearly the speed of light.